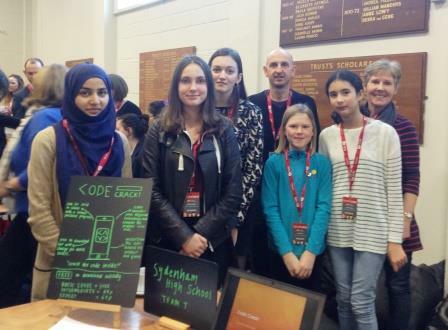 A Sydenham High team travelled to London last week (Monday 9 February) to take part in the first Girls’ Day School Trust (GDST) Digital Leaders’ Conference. The event, attended by nearly 200 girls from schools across the GDST network, involved teams competing to develop an idea for a new digital technology product or service. Supported by industry mentors from companies including Accenture, Atos, BT, Discovery Education and Morgan Stanley, each team produced a webpage, drafted a financial plan and delivered an elevator pitch to promote their idea. Speaking at the event was Ian Livingstone CBE, co-founder of Games Workshop and co-creator of the Fighting Fantasy gamebook series, who is now the Government’s digital skills champion. School ICT champions Mrs Jackie Sippitt (Junior School) and Mr Sam Atkins (Senior School) hope that the event will significantly contribute to inspiring the girls to develop a continuing passion for technology. The conference also saw the launch of the GDST ‘App Design Challenge’, which will involve students from across the GDST network competing to tackle a problem or issue they feel passionately about. Winners in three categories – social, gaming and lifestyle – will be announced later this year.